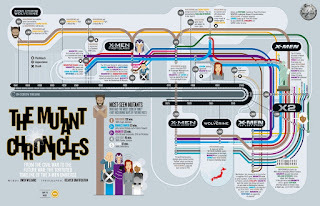 My wife doesn't really enjoy the, "X-Men films," because she (reasonably) feels they are often over-stuffed with characters, can drag a bit, and otherwise are just not as fun or interesting as the other Marvel movies (e.g. the Avengers-featuring ones). She does like the Wolverine-focused movies somewhat though, finding, "The Wolverine," to be pretty good (and she loved, "Deadpool," too as much as I did). Therefore, my wife expressed interest in seeing, "Logan," upon viewing some previews of it and learning it comes-out in early March. Then she asked me a question that seems so simple, but actually is disgustingly complex. She said, "So when does it take place with the other movies?" This led me down a rabbit-hole that left me exhausted and with a headache. This doesn't even include the latest movies. 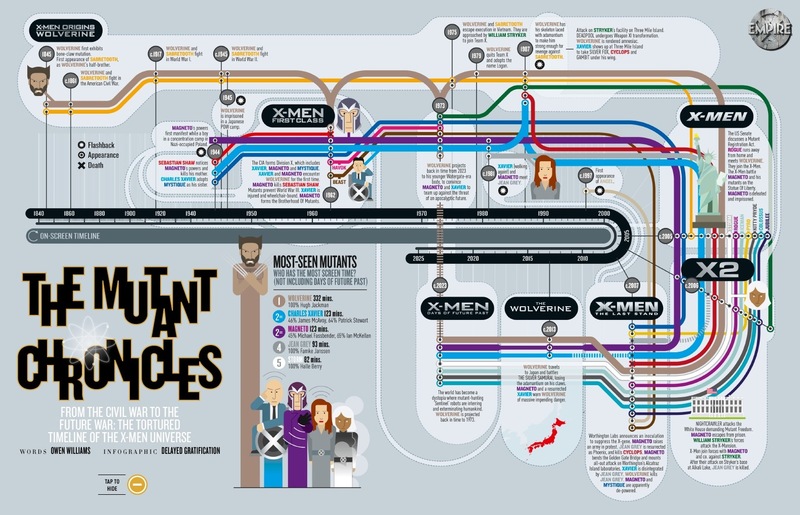 The X-Men movies are a mess in terms of logistics, there is no other way to put it. How do you explain that while the early movies kind-of happened that a later sequel-prequel altered the past enough that certain things did not? Where does, "Wolverine: Origins," stand considering it has another Wade Wilson/Deadpool who most people like to forget? Even ignoring the quandary of, "Origins," and how, "Days of Future Past," kinda hand-waved it away, the whole mess arguably starts with the otherwise stellar, "First Class." "First Class," already begins to throw a wrench into the movies, especially the question of when Xavier started needing a wheelchair as he also shown walking during some events of the third X-Men movie (and again, let's ignore the confusion of, "Origins," to make things a little less twisty)...and yet, when Wolverine meets-up with Professor Xavier and Magneto at the end of, "The Wolverine," it is made abundantly clearly throughout the earlier parts of that movie the 3rd flick happened (his hallucinations of Jean), but then, "Days of Future Past," picks-up from the end of, "First Class," while also being set the furthest in the future, followed by Wolverine completely changing things and undoing all of the movies basically except for the initial, "First Class," and then, "Apocalypse," which I'll admit I haven't even seen yet and most likely just makes all this worse; in the words of the great Austin Powers when he was trying to make sense of time-travel, "Oh no, I've gone cross-eyed." So, when the Hell does, "Logan," actually happen? Hugh Jackman apparently added fuel to this tire fire by casually mentioning, "Logan," was set in a slightly different universe. Now, as of today the film's director, James Mangold, tried to clarify things and say the movie is set 2029, set five years after the last (in a chronological sense) X-Men film. Okay, so this takes place five years after, "Days of Future Past," then....but wasn't the whole point of, "Days of Future Past," that Wolverine fixed that future and made everyone safe and happy despite, "Logan," making it look like everything is awful? Oh no I've gone cross-eyed again. That video just above this text is the best attempt at explaining everything I've been able to find, and even our presenter at the end gets angry and gives-up when discussing all the problems! I guess in some ways these movies with the X-Men and other mutant-related characters are the truest reflection of comic-books and the biggest struggle comics face--namely, dealing with an absurdly confusing continuity. I occasionally see rumors that before too long the X-Men movies will engage in a big reboot, wiping the slate clean and just starting fresh, much like the comic-books have attempted to do at times (and the God-Awful latest, "Fantastic Four," movie basically attempted). Whenever, "Logan," is supposed to take place, and in what cinematic universe is a query best left to not be overly-pondered, because comic-book continuity has always been a bit of a house of cards. The longer these comic-book movies are happening the more they reflect this. As a fan of comics who knows continuity can be both fun and a hassle, I think the easiest answer to the question of, "When does this movie take place," is to simply say, "It hopefully doesn't matter too much, let's just have a good time watching it."